At the Designer Sofa, we are proud of our craftsmanship and confident in our products longevity. We design and build from start to finish and with this in mind, we are confident that the end result is furniture that will last for years to come. Such is our confidence in our build quality, we are happy to provide a 35-year construction guarantee on all our sofas and chairs. Buying from us gives you the confidence and peace of mind that your furniture is built to last. The difference between us and many companies is that we don’t use modern mass produced manufacturing techniques. We combine modern technology with the old tried and tested ways of making furniture that date back over half a century. We put all our efforts into great designs and comfort, all our sofas are made with Wade Coil springs and hardwood frames. Each piece of our handmade furniture that leaves our factory is made individually for you. We source as many components from local and sustainable sources as possible. The wood for the frames is from the UK (from sustainable sources). The fillings for the cushions are made in Long Eaton. The Coil seat springs are made in Long Eaton. Most of the parts are made or supplied by British companies, which are good for the planet and good for the economy. We are a UK sofa manufacture your sofa will be made in Long Eaton recognised as a centre of excellence in the furniture industry. If you want to support the British economy and get a quality corner unit, sofa or chair The Designer Sofa of Long Eaton is the place to visit. Your sofa or chair can be upholstered in any fabric and made to any design you wish. 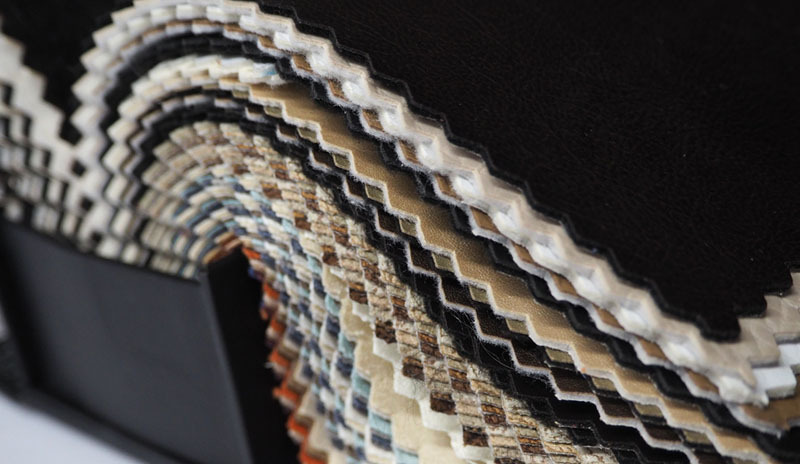 We have a fabulous range of the latest fabrics and we are confident that you will find the fabric you are looking for. Our team here at The Designer Sofa are always on hand to offer their expertise to help you choose your fabric, we can also provide samples. "We want to tell you how pleased we are with our settee and chairs. The suite has been much admired be family and friends and we are able to say we would highly recommend you.Malcolm is pleased to report his aches upon sitting for any length of time are much improved. Thank you once again for your attention to detail and excellent service." "We are sending as promised some pictures of our `new` 3 piece suite. It is hard to believe that this is our old one re-built! You have done an absolutely marvellous job – we are delighted. Friends who have seen it so far can`t believe what a magnificent job you have carried out and you have been such a friendly firm to deal with. Needless to say we shall certainly recommend The Designer Sofa to anyone who wants a new suite." "We enjoyed the friendly and helpful approach to the process of reupholstering our 20+ year old suite which has been transformed and looks very much as if it will last us yet another 20 years. The care taken at every stage from quote to delivery was exemplary and we'd most certainly recommend the Designer Sofa team to anyone looking to revive a tired sofa or chair." "Thank very much for your feedback, and it is reviews like this that make it all worthwhile. We are a family firm that treats people how we would like to be treated, from walking through the door for the first time, to coming to see your finished work before we deliver it to you. We ask all or customer to visit us when their work is compleated, whether is new or re-upholstery, to have a look and to make sure the work has been carried out to a high standard and they are happy before the balance is paid. Nothing is ever delivered to you unless it is 100%, we want you to be happy with the finished work. From all the team." "We thank you for all the help in designing a very comfortable 3 piece suit. We had been looking around all the large shops but there was nothing suitable, problems like sitting heights depth of seat height of arms and choice of fabrics. Designer Sofa because they are bespoke manufacturers we were able to solve all these problems in just a few visits their care and help was commendable and the result very satisfactory. I highly recommend this company." "People don't realise how easy it is to look for a sofa when you can have any size you want, and you have no restrictions. People are used to going around the shops and only finding something that will do but not right, and this is not good enough for most people. When you have experienced a bespoke company like The Designer Sofa and find out how easy it is to find your perfect sofa, you want to tell everybody as it makes life so much easier. We design comfort into your new sofa, and it is intended to last for years to come with a massive 35-year construction guarantee, that you just cannot get with a high street company. There is an old saying you get what you paid for, but with The Designer Sofa, you get more than what you pay for." "I can only describe my experience from start to finish as utterly fantastic. They made me feel so welcome and accommodated my every need. Once i got the chance view my new sofa i was blown away, just knowing that it had been produced for me from scratch is fantastic. No comparison to the big chains!! Personally this is the first sofa i have had made, but my family have had roughly 5 units. Every single one is just sublime!! I would urge anybody who is currently shopping around chains such as DFS and Sofology to pay these guys a visit. Of course they are a tad more expensive, but in the grand scheme of things the value for money is off the scale. Needless to say, i am ecstatic. Thanks so much to Ian and Taz for their fantastic service throughout :)"
"Thank you so much your review it is of the scale too. We want every customer who walks through the door to have a good experience and your review helps me to know we are getting things right. You are right you cannot get this quality on the high street, if you divide the money by how long you will want to own one of bespoke sofas you will not get better value anywhere. Smart shoppers like yourself do not get taken in by all the high street offer's, you just want quality and service at the right price. Thank you for your review. Ian and the Team"
"We looked for a local business where work is carried out in house. We set out to by new but following an inspection by Ian the salesman, we had our own furniture reupholstered. Thanks go to Tas, Ian and the whole team for a great job." "We have been making sofas in Long Eaton now for many years and we are very proud of our quality, service and advice. We always give the best advice tailored to each customer. In your case, you had spent some time looking for new, with no luck. I listened carefully to you and advised you had your existing furniture restored to its former glory. You didn't realize it at the time but you already had a well-made sofa that ticked all your boxes, why look for new. Thank You From all the team at The Designer Sofa"
"Excellent customer service. 4 years after the purchase of our sofa, we decided to alter the height of it. Ian gave us spare legs to try at home to make sure we got it right and then did the alterations for free. He also took the time to talk through different cushion types and made sure we didn’t make any hasty, expensive decisions." "At The Designer Sofa we think After Sales Service is really important as we want all our loyal customers to be happy for years to come. The alteration Mr Stewart wanted was not covered under the guarantee as it was not a fault but an alteration he wanted making after 4 years of having the sofas. I thought it was more important to help Mr Stewart than make a few pounds so I did not charge him for the alterations. We also take the same view when we first meet you and work out you requirements and need for your new sofa or corner unit, we don't use the fact we are bespoke to put the price up, when we know what you want we will always do as many of the bespoke alteration at no extra charge as we can, we don't want bespoke to be expensive. The reason we get get so many recommends and good reviews is we put customers first and keep the quality of or furniture high at a price you will like if you want quality furniture. Ian & the Team"
"Our sofa, chair and footstools where purchased 7years ago and apart from a few dog hairs I haven't brushed off today they still look as good today and are just as comfortable as when we had them. Furniture that's made to to your own requirements whether its extra support needed for a bad back or preference for a slightly taller chair back Is not a problem. The service, knowledge, quality and craftsmanship from all at The Design Sofa can not be beaten." "It`s nice to get feedback from a customer who has had our furniture for a few years and have had a chance to see how good it is. We can make furniture to fit you and your room, and if you have a bad back or some other medical condition we can make a sofa to help you. Our furniture is not mass produced very quickly like the sofa on the high street, each one is handmade especially for you. When your frame is made your name is put on it at the beginning and our craftsman will then turn it into your sofa or chair. Thank You from all the Team"
"Many thanks for the exceptional customer service we have had since having our suite re-upholstered with your company. We have been very pleased with the finished result and high standard of workmanship involved. All of your team have done a great job, even returning our suite, the boys managed to manoeuvre the suite back into position with no mishaps. We wouldn't hesitate to recommend your company to other people." "We supply quality and service you don't get in the big chain stores anymore, you are just a number to them. We are a family firm based in Long Eaton for many years now, we get to know many of our customs as they have been returning to us for over 20 years. We will help you if you want a bespoke sofa or your treasured old sofas reupholstered. That is why like you our customers would not hesitate to recommend us to friends and family. Thank You From all at The Designer Sofa"
"We are extremely pleased with our sofa, chair, footstools and cushions delivered last week. The standard of service from Designer Sofa was excellent from start to finish. From discussing style and fabric choices to placing the furniture in our house, everything was easy to discuss and agree. Delivery was on time to original estimate when order placed, and to suit us. Extremely high standard of workmanship, and so comfortable." "I do like all the feedback I get from customers, as the whole team put a lot of work into each and every piece made for every customer. We have a saying at The Designer Sofa that is, treat everyone as you would like to be treated yourself. We have been making handmade sofas & chairs now for over 20 years we still get a buzz out of doing things the right way. Thank you, from all the team"